The original wood cabins reflected their surroundings while newer designs embrace nature throughout the design. This is somewhat similar to what architect Mies Van der Rohe envisioned when he designed the Farnsworth house (as pictured above) in 1951. There are numerous modern cottages that have been designed similar to the approach of Mies Van der Rohe. 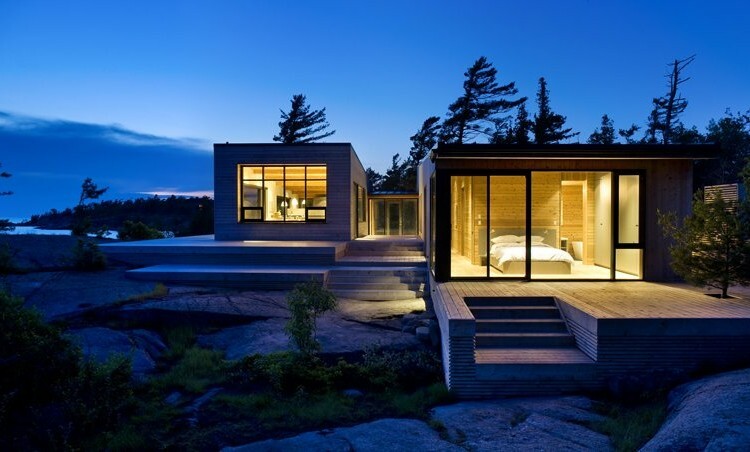 Sitting on the Georgia Bay in Ontario, Toronto-based firm superkul has situated a modern cottage home in its natural landscape. The aptly named SHIFT cottage blends in with its surroundings with the use of natural materials while its contemporary form adds visual interest. Alternatively, cottages that are self-sustaining are also gaining popularity. The Cliff House designed by Altius Architecture Inc encapsulates many sustainable principles that enable the inhabitants to live comfortably off the grid. When it comes to your own cottage remodel, these are a few examples that help you decorate your future home away from home. In terms of interior decorating, reclaimed wood and neutral walls are trendy yet timeless looks. Other modern touches can be simple ideas such as using branches as décor. Similarly, adding other natural elements like stone countertops or sinks add more eco-chic.